KELLY MARIE "FEELS LIKE I'M IN LOVE"
The video clip above features Kelly Marie performing "Feels Like I'm in Love" on the Dutch pop music show TopPop. This clip features, by far, the best sound quality of all the clips available online. Although disco music is usually associated with the 70s, it was still popular into the early 80s. 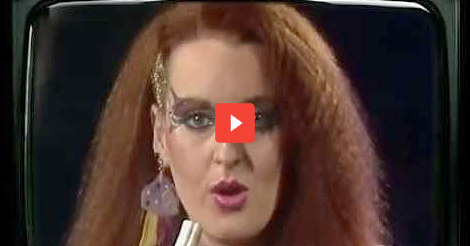 This disco track by Scottish singer Kelly Marie, was produced by Pete Yellowstone and made No.1 for 2 weeks in the UK from 13th September 1980. The single entered the UK singles chart at No.61 on July 27 1980. However, the song's original release in August 1979 failed to chart. "Feels Like I'm In Love" was actually written in 1977 by Ray Dorset (the frontman of folk rock band Mungo Jerry), with the aim of asking Elvis Presley to sing it, although it is not known whether it was pitched to Elvis before his death. Still, the song did give Kelly Marie her first chart hit after numerous releases, and two more hits were to follow; Loving Just for Fun (re-release) which reached #21 in November 1980 and Hot Love which peaked at #22 in 1981. The B-side featured the track "New York At Night". Kelly Marie's real name is Jacqueline McKinnon, who was born in Paisley, Scotland. She won Opportunity Knocks (the talent show hosted by Hughie Green) as Keli Brown, no less than 4 times.